Boy were these a dandy, the game 3 round 1 games were absolutely magnificent. For some games, it took OT or even more. High scoring games were in full effect as almost every series was 2-0 prior. Who would edge closer to a sweep? Here are recaps for all the eight games contested in Game 3 of the first round of the playoffs, along with a capsule of the most notable statistics from the contest. The Cavs wanted to put away this series to an end early and made a statement in game three in why they will sweep Boston. Lebron and Love we're both sensational as they had a terrific first quarter where they took a 31-25 lead. Love was on fire as he scored 9 in the first and found his rhythm early and the Celtics had no answer for him. LBJ couldn't be stopped driving to the rim and that hurt Boston a lot. The Celtics had a little run in the second as they tried to keep the game close until late in the second Lebron just took over and had 11 of his 31 points in the quarter before going into the locker room. He was driving in, shooting threes and pulling up. He couldn't be guarded. Nothing was going for the Celtics in the third and Cleveland weren't hitting their shots either but they did share the ball here a lot in the third and everyone was involved in scoring. Boston made it interesting in the fourth, they had a run in them but couldn't finish the job, it was like momentum was building up for them but it dropped once the Cavs put the basketball in the net. Kyrie had himself an off game but still hit two big shots in the closing moments of the game, he knew he had to make up for the bad performance and in the first three quarters so he took advantage of what he had. Love was unstoppable as he hit 8 threes in this one and couldn't be guarded. Notable Stats: LBJ- 31 PTS, 11 REB. Love- 23 PTS, 9 REB. Turner- 19 PTS, 8 REB. Chicago couldn't wait to play the Bucks, they played with such aggression and physical to win this game. A lot of back and forth action was occurring during the first, teams kept trading basket after basket and it was 27-27 after one. The Bucks had momentum going on their side as they were once up 49-31, but the Bulls kept fighting and stayed in the game as they found life late in the second to bring it down to single digits. Antekounmpo played amazing and was a flat out stud before the half as he scored 8. Rose brought his team back the lead and was catching fire in the third period, he was just unstoppable and couldn't be stopped. Scoring 9 and going into the final quarter with a lead was important with the way this game was going. Both teams were going at it, fast pasted action and intensity was in the air for the Bucks and Bulls into the 4th. Rose and Middleton were the leading scorers of the fourth but it was enough as we needed OT. It was bricks all over the place in OT as both teams couldn't hit a shot, it was a combination of 12 points and they couldn't settle it in there either! A second OT we went as Rose hit the dagger to put the game away and the Bucks stopped fighting. Notable Stats: Rose- 34 PTS, 8 AST. Butler- 24 PTS. Gasol- 14 REB. Antetokounmpo- 25 PTS, 12 REB. Henson- 14 REB. The Raptors really needed this game more than anything, they lost two at home which is unusual and needed to steal one in DC. DeRozan was just in charge as he scored 20 points in the first quarter and their lead was only by 2. Both teams really couldn't find momentum to go on their side and extend a lead. Washington found that as they went on a 10-0 run to take the lead by 4 and then the Raptors really had no answer as the Wizards lead stayed like that. The third quarter was so balanced as each teams were trading baskets and the lead wouldn't change at all. DeRozan was being shut down throughout three as he only scored 6 points after his 20 point first quarter. 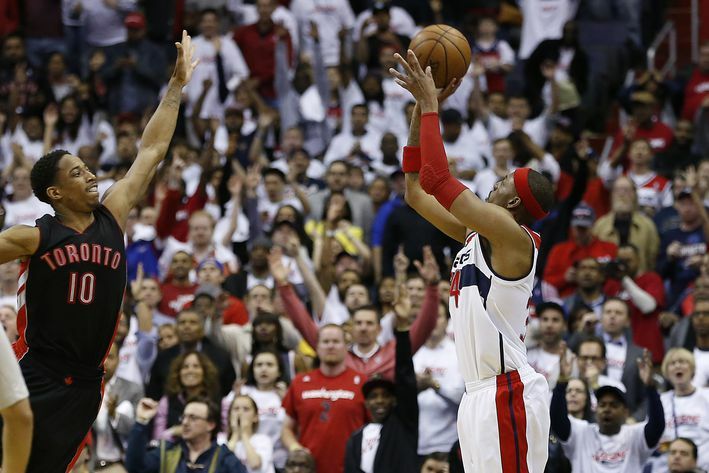 Pierce had 11 4th quarter points and and was HUGE at the end for the Wizards. He hit two big threes to seal the deal while the Raptors thought they were still in it. Notable Stats: Gortat- 24 PTS, 13 REB. Wall- 15 AST. DeRozan- 32 PTS. Johnson- 12 REB. Lowry- 7 AST. In what was a fantastic performance from Brook Lopez, the 8th seed Brooklyn Nets found themselves one game away from tying this series after they won a big one at home. They jumped out to a 15 point lead in the first behind Lopez is 7 points and everyone else contributing as well. Atlanta shot a poor 5-20 from the field on the road and couldn't get nothing going. They had little runs in the second but they couldn't cut the lead down to 5 or less because the Nets would just give them an answer if they had to. Young had a great second quarter and led the way with 6 points and his baskets came at the time where Atlanta would try to make a run but he scored and helped extend Brooklyns lead. Atlanta went on an 11-0 run to take a four point lead midway through three, but once that happened the Nets closed out the quarter on a 9-0 run with a 5 point lead going into the fourth. In the opening 5 minutes of the 4th, Brooklyn contained their run and finished it off as a 18-0 run that was really the dagger for this game. They were desperate and kept jacking up shots that weren't necessary. Notable Stats: Lopez- 22 PTS, 13 REB. Williams- 6 AST. Carroll- 22 PTS. Milsap- 17 REB. Teague- 6 AST. After two good games in Oracle Arena, the Warriors wished to get their brooms ready if there was going to be a sweep. If they won this then they were a game away. The thunderous crowd in Smoothie King Center were going crazy and cheering on their Pelicans to win game three. They led by one after one as Anthony Davis had 11 first quarter points and Curry had 10. A 13-0 run happened in the begging of the the 2nd quarter that extended New Orleans is lead to double digits. 5 players from the Pelicans had double digit points going into the half, they had a comfortable 63-52 lead. The Pelicans had a 10-2 run to close the third that had them up by 20. They just took a dumb on Golden State and it looked like it was over, everyone was involved in putting the ball in the net and free throw were a big part of them. With 7 minutes to go, it was a 18 point game and the Pelicans had this game in their hands until Golden state went on a 16-2 run and were down by 5 with 17 seconds left. Curry hit a three and now the lead was down to two. Davis makes 1 of his two free throws and it's a 3 point game, Curry missed a three then Speights got the rebound gave it back to Curry for more chance in the corner and it was GOOD! He hit it over Davis and Evans with two seconds to go to send it into OT! It should've been a foul on Davis as well. The Pelicans were down two with 10 seconds and they had to foul Curry who made both free throws and won the game for Golden State. Notable Stats: Curry- 40 PTS, 9 AST. Green- 17 REB. Davis- 29 PTS, 15 REB. Evans- 8 AST. Dallas was without Rondo and Parsons but they were down 2-0 in the series and needed a win badly if they wanted to come back. Harden had 10 first quarter points in which his team was up 42-36. A lot of action was going on between both teams and it was playoff basketball! Barea and Dirk helped him out with scoring points on the big run they had. A 12-2 run by the Mavs was enough to take the lead and have the game in control of their hands, Harden alone scored 11 of those 13 and was on fire. Teams kept trading buckets and at a point we seen bench players from both teams score a lot in this quarter. Harden finished off with 15 in this quarter and his team was up by 2. A 10-4 run occurred late in the fourth and Dallas found life. They were down by 2 with 7 seconds left and Monte Ellis who has a huge game couldn't tie the game at the buzzer and the Rockets had a 3-0 lead after three games. Harden had a phenomenal game and so did Ellis. Notable stats: Harden- 42 PTS, 9 AST. Howard- 26 REB. Ellis- 34 PTS, 9 AST. Nowitzki- 34 PTS, 8 REB. In what was a spectacular game two, we didn't see the same in game 3 in the Spurs vs Clippers series. The Spurs jumped out early with energy and fast paste in game 3. They had a 25-16 lead after one behind Lenoards 10 points. Los Angles went on a 9-2 run in the second and cut the lead to four, but it didn't mean anything after San Antonio had a 9-5 run to extend the lead to 8 after two. Lenoard, Diaw, and Green all scored for San Antonio and the Clips really had one scorer that quarter and it was Griffin. A 22-9 run ended the third as the Spurs took control of this game and there was no way the Clippers were getting back into this one. Lenoard scored 13 points in the third and he was playing amazing throughout 3 quarters. The Clippers never got close in the fourth, San Antonio kept scoring and scoring and it was a beating that the Spurs needed to give the Clippers. Notable Stats: Lenoard- 32 PTS. Duncan- 7 REB. Ginobili- 6 AST. Griffin- 14 PTS, 10 REB, 5 AST. Portland has been affected by injures recently and needed to pick up their slack here at home in game 3, it would be tough to do so. Courtney Lee scored 10 points in the first quarter and his team was up 24-19 early. An 11-3 run by Memphis closed out the first half and Portland had no answer for them, it was like only person scoring for the Blazers and it was Lillard. Conley had a great 3rd quarter when he scored 12 points and unbelievably looked comfortable. Memphis had a 62-49 lead after two. Conley left the game in the third period but it didn't matter as his team was still up by double figures in the third. Randolph was dominate found his rhythm in the third and couldn't be stopped. Was still a 10 point lead after three. Portland got it down to 6 with a 1:12 left and they tried to take over the game but couldn't, free throws really hurt Portland and so did Calathes off the bench. Lee was an amazing help to the Grizzles when Conley went down. Portland missed a lot of shots that hurt them because they had tons of chances to tie the game or make it even closer than it was. Notable Stats: Gasol- 25 PTS, 7 REB, 4 AST. Lee- 20 PTS. Batum- 27 PTS. Aldridge- 7 REB. Lillard- 9 AST. How many sweeps are shaping up in Round 1? Game recaps and notable statistics for Game 3 of the first round of the 2015 NBA Playoffs.